Eve Ellis is a licensed professional counselor with 5 years experience working with children and teens in therapeutic settings and over 10 years experience working with children and teens in equine settings. 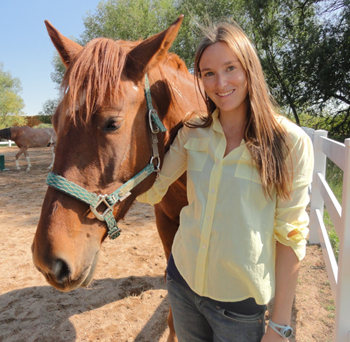 She has advanced training in play therapy, wilderness therapy, equine assisted psychotherapy and transpersonal counseling. Eve works with individual clients as well as groups. She runs grief groups, addiction groups and various other therapeutic groups for adults and children. Eve finds the equine-human relationship both empowering and revealing, and loves working with the horses to help people find self-confidence and hope. Her training in Play Therapy has been extensive and Eve finds this form of therapy to be an incredible way to help children grow and heal through many of life’s difficulties. Eve has the ability to balance compassion for the individual’s journey with practicality for enacting change and encouraging growth. Transpersonal Psychology includes the traditional views of psychology coupled with a broader idea that clients are impacted by their mental, physical, emotional lives as well as their family, environment and spiritual outlooks. This modality of therapy concentrates on all of the attributes that contribute to someone’s current mental states and emotional patterns. Transpersonal Psychology combines knowledge from both Western and Eastern studies of psychology, allowing a larger framework for therapy and for clients. Wilderness Therapy uses the natural world to create and support therapeutic relationship. Eve has been trained to incorporate nature through many different aspects such as rock climbing, hiking, gardening and horseback riding. Both of these therapeutic standpoints concentrate on the “big picture.” Eve believes we are interconnected with all of the systems that surround us. Although there are times when we feel alone, we are still making an impact; we are still powerful and influential beings.